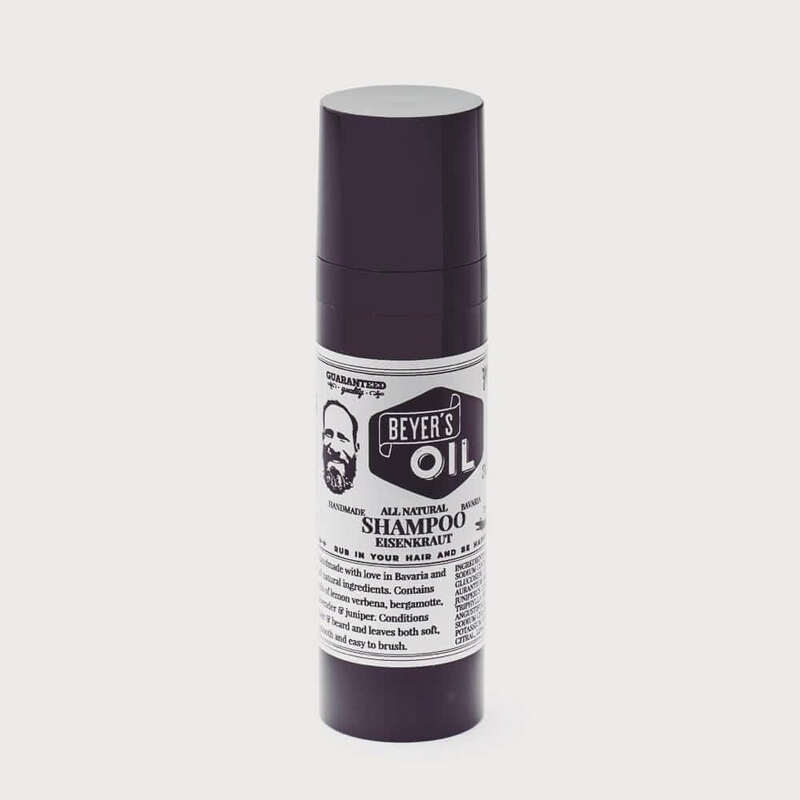 The Beyer’s Oil Shampoo Eisenkraut in a handy travel size. So small, you can can take it on the plane. When it’s empty, you can remove the cap and refill it. Beyer’s Oil Shampoo Eisenkraut gently cleans and conditions. It was specially formulated for your beard, but can also be used on dry head hair. The ingredients make your hair easier to comb and more bouncy, soft and smooth. Premium lemon verbena, blended with bergamot, lavender and juniper essential oils, creates a fresh scent, as well as offering antiseptic and rejuvenating properties. Premium lemon verbena (German: Eisenkraut), blended with bergamot, lavender and juniper essential oils, creates a fresh scent, as well as offering antiseptic and rejuvenating properties. The fragrance has fresh citrus notes, without sweetness. All ingredients used in Beyer’s Oil Shampoo Eisenkraut are natural cosmetics compliant. Wash beard and head hair with Beyer’s Oil Shampoo Eisenkraut and rinse. INGREDIENTS: AQUA, COCO-GLUCOSIDE, SODIUM COCO-SULFATE, LAURYL GLUCOSIDE, GLYCERYL OLEATE, CITRUS AURANTIUM BERGAMIA PEEL OIL, JUNIPERUS COMMUNIS FRUIT OIL, LIPPIA TRIPHYLLA HERB OIL, LAVANDULA ANGUSTIFOLIA OIL, CITRIC ACID, SODIUM CHLORIDE, SODIUM BENZOATE, POTASSIUM SORBATE, LIMONENE, CITRAL, LINALOOL.